stanton’s, houston | Is there any wine left? Sometimes I am driving along minding my own business and I notice a bunch of cop cars gathered together and I am overtaken by an urge to pull over and ask what’s going on. I’m nosy like that. So the other day, I was driving up Houston Avenue from downtown and saw a ramshackle old building surrounded by police cars and I wished I knew what was going on. In fact, I was still thinking about what could have happened later that afternoon. Then about a week later, I drove by the same building and there were another four or five police cars parked there. That’s when I noticed the sign on the side of the building advertising Houston’s Best Cheeseburger. So mystery solved. The cops were all just getting a bite to eat. This place is just a few blocks from the Houston Police headquarters. Good news = discovery of a new great burger place. Bad news = no fascinating crime scene. But… maybe this is actually good news. 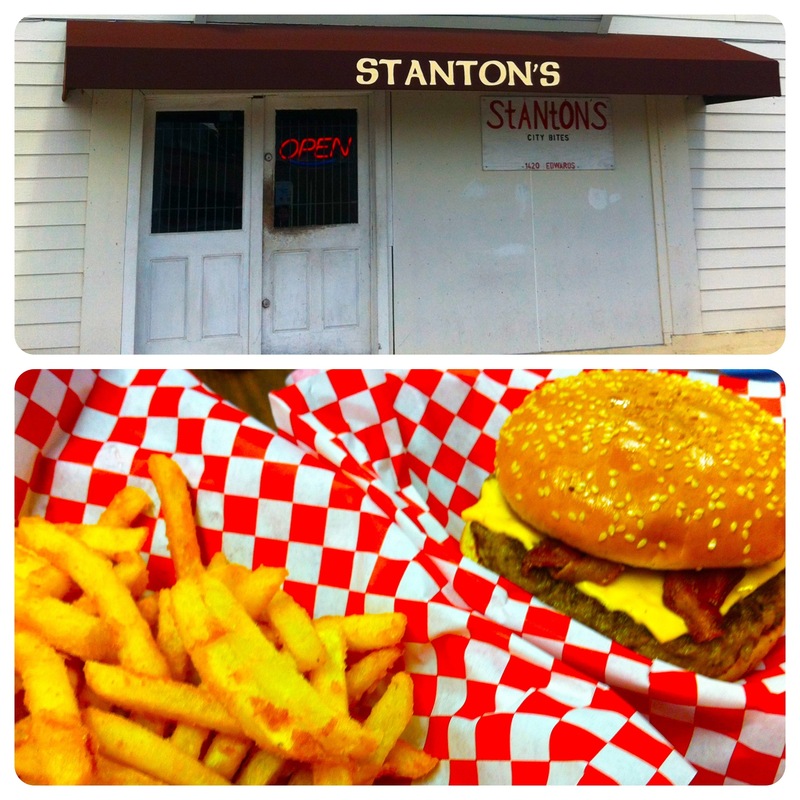 Anyway, I grabbed Whitney for lunch earlier this week and we went to Stanton’s to see if it really is the best cheeseburger in town. Short answer: probably not the best. But very, very good. We both ordered bacon cheeseburgers and split an order of fries. I have a major pet peeve about flimsy bacon on a burger. Stanton’s bacon was crunchy but not overcooked. The cheese was a regular slice of American, but there was nothing fancy about this burger, so smoked gouda would have been weird. It was just plain good. Also, the fries were extra-crispy, which I loved. Don’t be put off by the appearance — its an old convenience store. But inside are some really great burgers and they’re worth the stop. Looks good. So, who do you think has the best burger in Houston? Looks good! So, who do you think has the best burger in Houston? My favorites are Lankford Grocery, the bar at Fleming’s, and Goode Co Taqueria. I haven’t been to Hubcap Grill but I heard theirs are awesome. What’s your favorite? Absolutely! Next time you are in town we will have to visit! My favorites are Lankford Grocery and Max’s Wine Dive. Also, Christian’s Tailgate has a good burger. I’ve heard that Vic and Anthony’s burger is good for their Friday lunch, but I’ve never been. I haven’t been to Hubcap Grill, but I’ve heard it’s great.